The Kumano area is a mountainous region in the south of the Kii Peninsula, lying for the most part in Wakayama Prefecture. 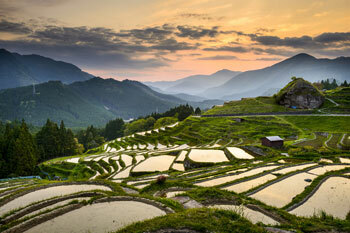 It is one of the most sacred pilgrimage destination in Japan. 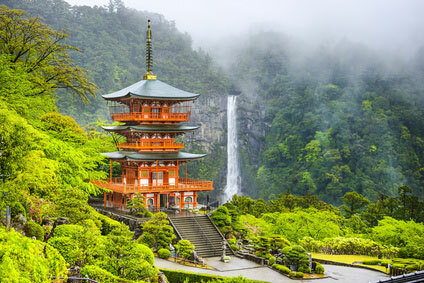 For over 1000 years the Kumano Kodō, a series of ancient pilgrimage routes, has linked the Kumano Sanzan ("Three Grand Shrines of Kumano") with each others. The three shrines are the Hongū Taisha in Hongū, the Hayatama Taisha in Shingū and the Nachi Taisha in Nachi. They are located from 20 to 40 km from one another. In 2004, the UNESCO listed the whole region as a World Heritage Site, as part of the "Sacred Sites and Pilgrimage Routes in the Kii Mountain Range". The routes are twinned with Spain's Route of Santiago de Compostela, another UNESCO World Heritage Site. Besides the historical and religious significance of the Kumano Sanzan, the region itself is one of profound natural beauty. Besides the 133m-high Nachi Falls at the Kumano Nachi Taisha, the Doro-kyō Gorge (瀞峡), 2 hours away by boat from Shikō up the Kitayama-gawa River, is generally acclaimed as Japan's most spectacular gorge. The mystic atmosphere and natural splendour of the Kii Peninsula made it a perfect imaginary abode for Shintō deities in ancient times. One could say that the Kumano region was a sort of Mt. 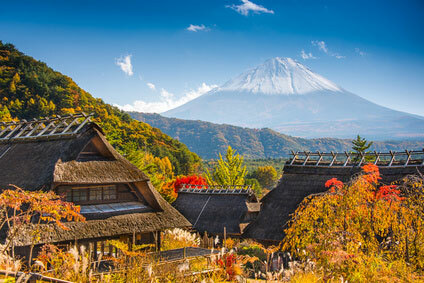 Olympus for the Kansai region, the cradle of Japanese civilisation. According to the legendary account in the Kojiki, Jimmu (711-585 BCE), Sun Goddess Amaterasu's great-great-great-grandson, left his native Takachiho in Kyūshū and moved east in search for a more appropriate location to rule over the country. He landed at Kumano, from where, guided by the Yatagarasu (three-legged crow), he entered the Yamato plain and became Japan's first emperor. 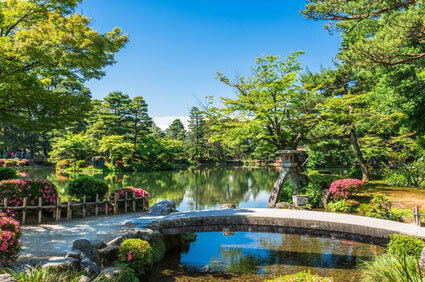 Buddhism was introduced to Japan in the 6th century. In the 10th century Shintoists in the Kumano region assimilated the new beliefs and its ascetic practices. The deities of Kumano Sanzan were adapted into a unique fusion of Shintoism and Buddhism (known as Shinbutsu shūgō), making them the most powerful in Japan. The three Shintō shrines appropriated themselves the new Buddhist deities, so that Kumano Hongū Taisha became devoted to Amida Nyorai (Amitābha, the Celestial Buddha, mainly revered by the Pure Land sect), Kumano Hayatama Taisha to Yakushi Nyorai (Bhaisajyaguru, the Buddha or Healing, much venerated in Shingon Buddhism), and Kumano Nachi Taisha to Senju Kannon (Guan Yin, the Buddhist Goddess of Mercy). 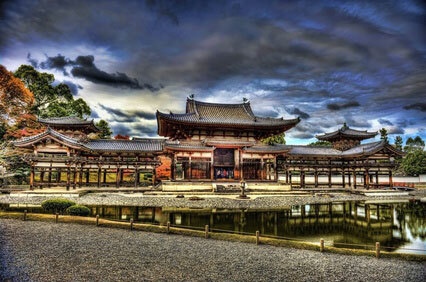 During the late Heian period the Kumano region was identified as the Buddhist paradise of the Pure Land. The Three Grand Shrines became a pilgrimage destination for the Imperial family and the nobility. The Nakahechi (中辺路) route from Kyōto spanned over 400km, so that the round trip took pilgrims 4 to 6 weeks. During the Warring States period, the pilgrimage had become so popular that commoners vastly outnumbered aristocrats. Thee mountain trails had become so crowded with pilgrims that the term "ant procession" was coined to describe it. Kumano Hongū Taisha is the head shrine of over 3000 Kumano shrines around Japan. It is dedicated to the Shintō deity Ketsumiko, later equated with Amida Buddha. The shrine first appears in historical documents in 859. 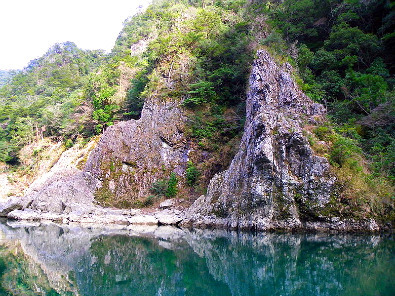 It was originally located in Ōyu-no-hara (大斎原), a sandbank at the confluence of the Kumano and Otonashi Rivers. It was moved to its present location in 1889 owing to recurrent floods. Visitors enter through the largest Torii gate in the world (33m high) and ascend a staircase to cedar-filled hilltop. The shrine's emblem is the mythical Yatagarasu (八咫烏), the three-legged crow that led Jimmu to Yamato (see history). The three legs symbolise heaven, earth and mandkind. Like Ise Jingū, it is built in unpolished, unpainted wood, allowing it to blend with the natural environment. Shintō customs require that shrine buildings be constantly reconstructed every three decades or so. Nevertheless the architectural style has remained the same for at least eight centuries. 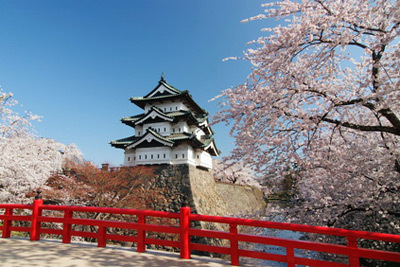 In contrast with Hongū Taisha, Hayatama is a bright vermillion and white structure. It was last rebuilt in 1894. Look out for the 800-year-old Nagi tree (a conifer of the Podocarpus genus), revered as a kami. The Treasure Hall contains dozens of objects listed as National Treasures. In the backdrop is Mount Gongenyama. 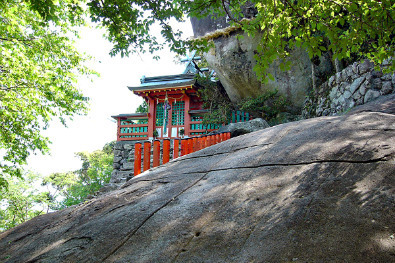 Halfway up is the Gotobiki-iwa (琴引岩), a huge sacred rock upon which the deities of Kumano are said to have descended on earth in a Shintō creation myth. The rock has been a place of worship at least since the 3rd century and now has a dedicated shrine, the Kamikura-jinja (神倉神社). Two major festivals are held at the shrine. The Mifune Matsuri (御船祭), held on the third Sunday of May, is a boat race on the Kumano River. The festival opens with a portable shrine carried on a bright red boat with "Hari Hari Dance" performed for the local deity. It is followed by nine speed boats racing each others around an island. The origins of the festival are said to date back to the 3rd century. The second festival is the Otō Matsuri (御燈祭), a fire festival held on 6th February. Each of the 2000 participants wear traditional straw clothes and carry a torch up the steep stone staircase to the Kamikura Shrine. Located halfway up Mount Nachisa, some 350m above sea level, Nachi Taisha has long been a retreat for the ascetic training of yamabushi (山伏 mountain hermits) practising Shugendō. 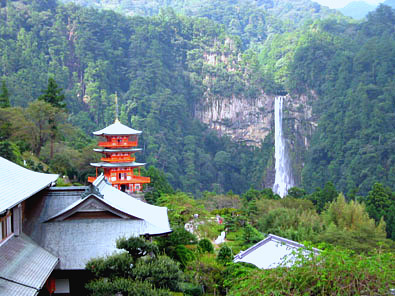 What attracts visitors though is the spectacular Nachi Waterfall (那智滝), Japan's second highest waterfall. They drops at a height of 133m and can be seen from the Pacific Ocean. The vermillion Seiganto-ji Temple (青岸渡寺) stands very picturesquely in front of the waterfall. Legend has it that the temple was founded in the early 5th century by priest from India who had drifted ashore. Until 1868, when the Meiji government forced the separation between Buddhist and Shintoist institutions, the temple was known as Nyoirindō and was an integral part of Nachi Taisha. Another Buddhist temple, the Fudarakusan-ji (補陀洛山寺), is located approximately 6 km downstream from the waterfall, in front of Nachi Station. Between 866 and 1722, at least 21 priests are recorded to have died by sailing out into the ocean in search of the "Fudarakusan" (Buddhist Pure Land). The Kumano mountains has its fair share of hot spring resorts. The most renowned are located around Hongū and Totsukawa. 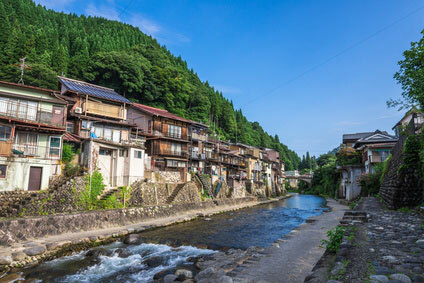 Totsukawa's famous onsen are the Kamiyū Onsen (上湯温泉), Totsukawa Onsen (十津川温泉) and Tōsenjō Onsen (湯泉地温泉). 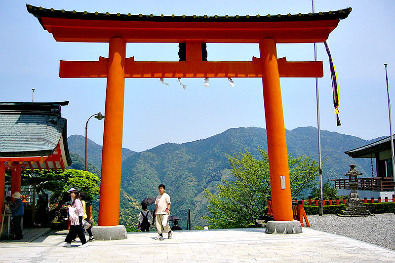 There are three principal ancient pilgrimage routes leading to the Three Grand Shrines of Kumano. They are known collectively as the Kumano Sankeimichi (熊野参詣道 ; "Pilgrimage paths to Kumano") or Kumano Kodō (熊野古道 ; "Ancient roads to Kumano"). 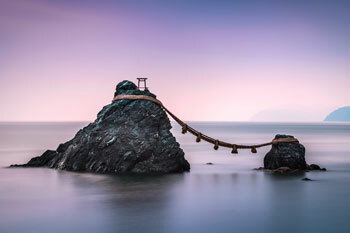 The traditional pilgrimage route from Kyōto is the Kiiji (紀伊路 ; "Path to Kii"), which runs along Ōsaka Bay and the west coast of Wakayama prefecture until Tanabe city, where it forks in two. The first route is the Nakahechi (中辺路), which climbs into the rugged interior of the peninsula, following roughly road 311 to Hongū (57km, about 12 hours' hike), then continues to Shingū (an additional 35km, about 8h) following the very scenic and precipitous road 168 along the Kumano River. 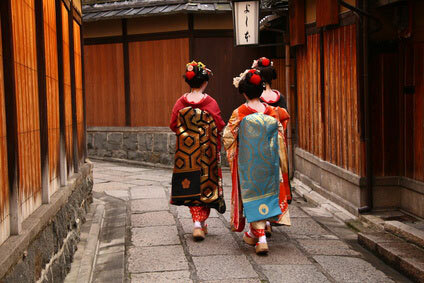 The Nakahechi dates from the early 10th century and was the most popular route with pilgrims from Kyōto. The second route is the Ōhechi (大辺路), which continues south from Tanabe along the coast all the way to Katsuura, then inland to Nachi Taisha (107km, 23h) or further along the coast to Shingū (111km, 24h). This was the route used by mountain ascetic practicing Okugake as aell as devout Buddhists who repeated the 33-temple Kannon Pilgrimage around the Kansai. The mountain path between Kōyasan and Hongū is the Kohechi (小辺路). The 68km route passes three peaks exceeding 1,000m and runs via the hot spring villages of Nosegawa and Totsukawa. It alternates between earthen path and paved road. It is probably the most popular route for Western tourists. There is a fourth route for pilgrims coming from eastern Japan, the 160 kilometre-long Iseji (伊勢路) from Ise Jingū. It is too long to be popular nowadays. The Kumano Sanzan area is the most time-consuming part of the Kii peninsula to reach. Hayatama Taisha is located in Shingū. It can be reached fairly easily from Shin-Ōsaka Station on the JR Super Kuroshio or JR Ocean Arrow line (4h, ￥6,500). From Shingū Station it is a 15 minute walk to the shrine. For Nachi Taisha, you should first take a train to Kii-Katsuura (紀伊勝浦) Station, which takes 3h40min from Shin-Ōsaka Station (￥6,190) on the same line as for Shingū. Once in Kii-Katsuura, catch a bus to Nachi Taisha (30min, ￥600). Buses stop at Daimonzaka, at the Nachi Waterfall, and at the Nachi Grand Shrine. If you are coming from Shingū, take a local train to Nachi Station (17min, ￥230), from where you can also catch the bus to the shrine at lesser cost (20min, ￥470). The fastest way to approach Hongū is from Shingū by bus (2h, ￥2,000). A longer but more scenic alternative is to combine train and bus from Nara. You shuold first get from Nara to Gojō (五條) by train (1h20min, ￥950), then board a Nara Kōtsū bus bound for Kumano Hongū. The road through the mountain range is breathtaking but takes 5 hours (￥3,900). So the whole journey from Nara will take over 7 hours depending on how long you have to wait for the bus connection in Gojō. There are only 3 daily buses between 9:00 am and 2:00 pm.